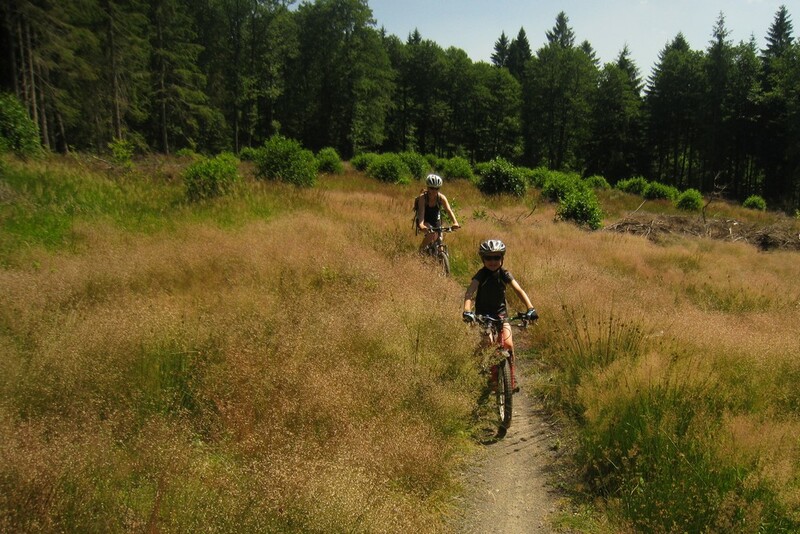 Summer vacations are merrily passing by and so Locus Map Team doesn’t hesitate and maps another one of a few Czech bike resorts – Singltrek pod Smrkem. The resort is placed in the Northern part of Jizerske Mountains on the slopes of the highest peak Smrk and its neighboring ridges. 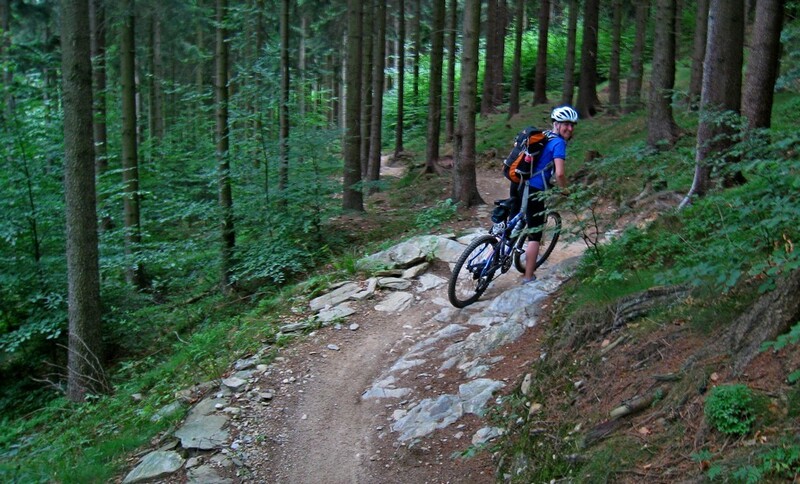 The major part of the trails is winding on the Czech land, several paths are situated in Poland. According to the information on the web the trail network totals about 80 kms and individual trails are sorted by their difficulty and marked in relevant colors. The green trail is the most simple, the path is wide and bikers ride it in both directions. All other sections are one-way due to riders safety. The blue ones are a bit more playful and ascending/descending the Jindrichovice ridge. Red trails are declared intermediate and demanding certain riding skills – the trail is full of twists and swings and unexpected obstacles that, however, can be easily handled. The black sections are marked as the most demanding – the trail offers bare roots, rocks and occasional jumps. Nevertheless, all of them can be avoided or carefully handled – we managed to ride the black trails with the youngest member of our crew strapped in a suspended kids seat – all without need to get off the bike. How to prepare your Locus Map for the trails? First of all the right map is essential. Of course vector Locus Maps or biking maps by SHOCart contain Singltrek trails but they’re without the color distinguishing, the section names and the entrance points. Smart Maps offer their own application with a map of the Singltrek, however, the app is nowhere near the span of functionality of Locus Map. The ideal solution is to download the map from the Internet here or here and calibrate it directly in Locus Map. The calibration is a quite simple process that can be tackled in a couple of minutes the evening before the trip. Detailed description of the on-board calibrator can be found in our User Guide >>. Utilization of other Locus Map features on the trails is up to you. The track recording is basic, the dashboard displays speed, distance, elevation gain, heart rate etc. during the ride. If you had planned a particular trail route in advance, don’t forget to turn on the navigation or guidance. Well and before you set out, don’t forget to check the weather forecast! Where to enter the trails? There are plenty of the trails access points for sure. Here we’re gonna mention only those nearest the settled areas or those which offer more than the entrance signpost. It declares itself as the “main” Singltrek entrance point. The simple green trail begins here and the Jindrichovice blue ridge trail ends here. The point is situated north of the town of Nove Mesto pod Smrkem nearby a pond with a camp. The Center offers simple refreshment, possibility to wash your bike for a fee and test Author bikes. Expect, however, a fee for parking. An option of wider choice of refreshment in a few other kiosks in the camp can be an advantage. You’ll find this spot south of Nove Mesto in the Kyselka valley with mineral water springs. A cosy wooden cabin offers a variety of refreshment including grilled sausages or a warm soup. Then there’s an option to wash your bike or try new bikes made by Trek. The local serviceman can handle minor repairs or adjustments. The parking is charged as well. The cabin is placed nearby the red trail “Novomestska” but you can also ascend through the valley up to the Libverda bridge to the intersection of a black trail and traversing forest road. The access point above the northern part of Lazne Libverda. The red section from the Hubertka cabin finishes here and the red “Ludvikovsky” traverse begins. The pub Obří Sud offers a standard Czech cuisine assortment but don’t expect any extra services for bikers. The parking is charged again. The least frequent entrance point with no services. It’s placed near Libverda cemetery north of Hejnice. 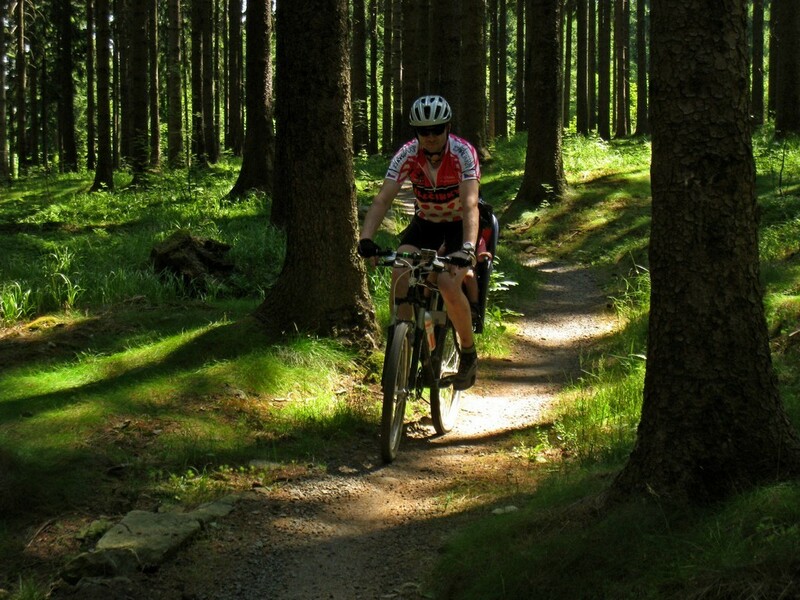 An attractive black section turns here and you can easily climb along it towards Hubertka cabin or further on deeper to Jizerske mountains if you wish to explore more its beauties than just this bike resort.